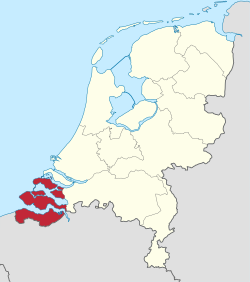 Zeeland [ˈzeːlɐnt] ( listen), crie Zealand in Inglis an aw, is the wastmaist province o the Netherlands. 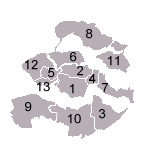 The province, locatit in the sooth-wast o the kintra, consists o a number o islands (hence its name, meanin "sea-land") an a strip borderin Belgium. Its caipital is Middelburg. Wi a population o aboot 380,000, its aurie is aboot 2930 km², o which amaist 1140 km² is watter. Lairge pairts o Zeeland are belaw sea level. The last great floodin o the aurie wis in 1953. Tourism is an important economic activity. Its beaches mak it a popular holiday destination in the simmer. Maist tourists are Germans. In some auries, the population can be twa tae fower times heicher durin heich simmer saison. The coat o airms o Zeeland shows a lion hauf-emergit frae watter, an the text "luctor et emergo" (Laitin for "A struggle an A emerge"). The Pacific naition o New Zealand is namit efter Zeeland. This page wis last eeditit on 8 August 2018, at 14:05.